“Welcome To The Ravenland” is the first official full-length presentation of RAVENCLAW, out from the cold Slovakia Republic. The band's Power Metal atmosphere is rather cold and you can actually feel it through their album's artwork. If you are looking for various influences you will find touches of acts as STRATOVARIOUS, SONATA ARCTICA, KOTIPELTO, AVANTASIA, NIGHTWISH and EVERGREY. 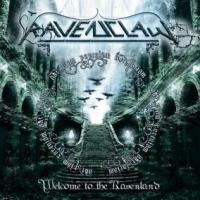 Although “Welcome To The Ravenland” and RAVENCLAW's style is not a new drop of blood in fantasy themed Power Metal, with their talents, RAVENCLAW made their newest effort with elegance. While trying to be catchy to a certain point, they tended to exercise elements both from 00' and the 80's. A large stack of their riffs and passages are pretty much generic and widely expected; nevertheless, with the integration of the vocalic menace of Mat Valiska (along with band's backing vocals) and the keyboards man Gabriel Sipos, their material has taken a step forward from regularity and into the next level. After making an entrance with a rather dull welcoming tune, RAVENCLAW began their ride with some memorable melodic tunes. While listening to their release, you can actually think about ferries, rather than ravens. This release is far from being black and grey as its spirit is rather more merry than depressive. Several of their presented hits are as “Light From You”, “Into The Night”, “Déjà vu”, “Brother Sun”, “Eyes Of The Damned” and "…To put my mind at ease" with of “Dragon's River”. However, with the brightness of their material and their chunky sound, “Welcome To The Ravenland” didn't receive the best treatment while concerning the production. This is not the first time, and boy that I am disappointed to come across it again. The term Phase Resolution is an issue that is probably known within producers. To your mind at ease about resolving this term, there you have it. While hearing this release there are only a few channels that can be heard in stereo. The main channels like vocals, lead guitars and bass can only be heard in mono from one side. This is one damn problem that producers should look out. In the case of producer, Martin Barla, that didn't happen. The tunes can great and all, but the general feeling is of sort of a miss because you can't feel in the entire listening experience. In general, this debut album is a fine display of talents. You will find shreds of originality from talented musicians, however don't expect too much. Moreover, the production, although it provided a good sound, was drenched with that phase resolution deal and didn't help the band for sure.